As the first ultra ever to formally recognize Athletes With Disabilities in their own division, the 2017 VT100 race crew is proud to bring you this interview with upcoming AWD participant Jason Romero. 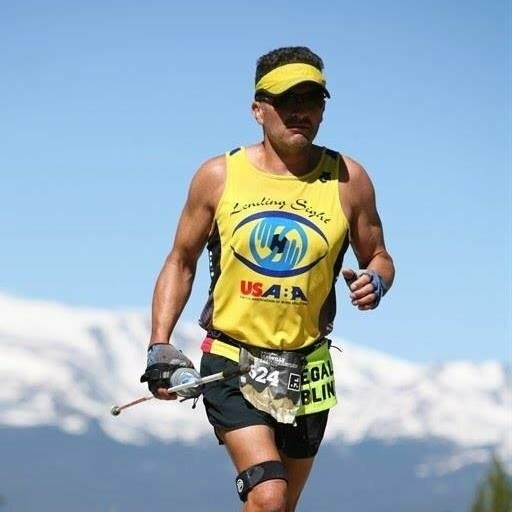 Jason Romero is ultra runner from Denver who plans to toe the line in what is sure to be a historic 2017 VT100, marking a truly special moment for ultra running as a sport and athletes with disabilities everywhere. In middle school, Jason was diagnosed with Retinitis Pigmentosa, an incurable degenerative retinal disease​. The condition is characterized by night-blindness, decreased visual acuity and a consistent loss of peripheral vision. In 2016, Jason ran across America in 59.5 days, averaging 51.5 miles per day. He is a member of the U.S. Paralympic Team, where he placed 4th in the world at the marathon in 2015. He has completed 12 runs of 100 miles or longer, including Badwater and Leadville, and a finished a solo Rim2Rim2Rim crossing of the Grand Canyon. So, needless to say – Jason is a badass! But he’s not just in it for himself. He gives back so much to people and community, too. When Jason is not running, he can be found volunteering at schools, service organizations, churches and youth detention centers speaking about overcoming adversity. He works as a motivational speaker specializing on business topics like teamwork, leadership, risk taking and change. Jason is also a single father of three – Sierra, Sage and Sophia – and serves on the board of two nonprofits that help the homeless and provide mental health services. Q. How has your training been so far? Training has been going well. I’ve had a good base building spring with a couple marathons and a longer 81 mile race at Badwater Salton Sea that went well. Since then I’ve been working on forcing my body to handle multiple 20+ mile sessions in a week. No major injuries to speak of, so I’d say things are going well. I’ve purposely not incorporated speed work, as all of this training and racing is leading to one race that happens at the end of September. And that race requires Long Slow Distance (LSD) training, in my opinion. Q. How do you train for trails while living in the city of Denver? When I stopped driving, I changed from being a trail runner to a predominantly road runner. I had to get creative to simulate climbing and building leg strength. I had heard that Marshall Ulrich trained for his run across America by dragging a tire. So, I made a “tire drag” (video content), and that’s how I build hip strength and simulate hills. I also have a hill at a park close to my house where I will do hill repeats of an hour, and sometimes 2, if I’m feeling crazy. I have a lot of experience running technical trails when I used to race trails like the Leadville 100 Trail Race. I also trained on Pikes Peak and ran the Barr Trail to the top and back too many times to count. I’m confident on my experience with foot placement and understanding how to handle scree fields, ankle biter rocks, rooted sections and culverts that drainage flow creates in trails. That said, I expect to fall and be bloodied every time I run a trail. That’s just how it goes when you don’t see well. I’ve found that if I hold back, I get hurt worse than if I just let ‘er rip and run as hard and fast as my body will allow (regardless of what my eyes can see). Q. Is Vermont a training run for something larger, or a recovery run from Bad Water? Vermont is a training run in this year’s racing schedule. As mentioned above, my A race is in September – Spartathlon. For me, every step this year will lead to the foot of the statue of King Leonidas, the finish of the Spartathlon. I have attempted the race for the past two years and timed out at mile 100 and 120. This year, I hope to make it to the end – mile 153 in under 36 hours. I’ll be pacing at Badwater the weekend before Vermont. I’m helping the guy who is going to guide me for Spartathlon. I expect to run 40-50 miles at Badwater, but I’m taking the night shift when it’s not so hot (100 degrees or so). This coming weekend I’ll run the Bryce 50 which should have similar terrain as Vermont and has a decent amount of elevation gain. After that, I’ll be putting in a marathon every weekend, and running every day. Usually, the week before a 100 mile race I stop running cold turkey. No shakeout run or anything. I’m so old I like to save every step and ounce of energy for race day. Q. What’s your A goal for Vermont? Q. Do you have a B and C goal? Q. What is your race day strategy? Stay relaxed and feel fresh at mile 70. If I’m doing good at that point, I’ll fire the jets and race to the end. This has been a dream of mine for a long time. I have ran ultras for a long time, and I was “in the closet” as a blind person. Only in the last few years have I come out of the closet. It has long been a dream of mine to see the USATF and the IAU recognize records for athletes with disabilities in ultra-running events. Amy and VT100’s leadership in this area can go a long way toward making this a reality. Records are made to be broken, and it will pull more people from their couches and isolation to running which combats depressive chemicals and builds community. Life is better with running. Challenged athletes will see that they are welcome at ultras, and believe it is normal for them to participate in the events. The Boston Marathon was a pioneer in creating an AWD division for marathoning. Now, there are multiple marathons, halves and shorter distance races that recognize the division. And, I believe, as a result of these divisions we have more challenged athletes participating in these races. I think it’s huge and inspiring for able bodied athletes to race alongside challenged athletes. I think it’s also more eye opening for able bodied athletes to be beaten by challenged athletes (I hope to open some eyes at Vermont this year). Want to learn more about Jason, his speaking engagements, his movie, his athletic pursuits, his leadership and more? Visit Jason’s website today. Want to learn more about AWD at the 2017 VT100? Check out the VT100’s post on AWD Division Rules & Regulations or our amazing interview with upcoming AWD participant Kyle Robidoux.